Idolish7 is a Japanese rhythm game developed and published by Bandai Namco Entertainment with music collaboration by Lantis for Android and iOS platforms, which first released in Japan on August 2015. The project features character design by Arina Tanemura. The franchise has expanded a lot since then, from a large discography with many songs topping charts, multiple merchandise, Music Videos by various animation studios, multiple manga and novel adaptations, a PlayStation Vita game, a live concert and an Anime adaptation by Troyca which premiered in January 2018. The project has released several manga and novel adaptations. A manga adaptation is drawn by Nokoshi Yamada and is serialized in Hakusensha’s Hana LaLa Online since 2015 and the first volume was released on December. Another manga that focuses on idol group rival of IDOLiSH7, TRIGGER, is titled Idolish7: TRIGGER -Before The Radiant Glory- which written by Bunta Tsushimi with illustrations by Arina Tanemura and was released on December 2016. Beside manga, an official fanbook was released on June 2016, following by the second fanbook that released on August 2016. Bandai Namco Entertainment released a tie-in console video game titled IDOLiSH7 Twelve Fantasia! for the PlayStation Vita on February 2018. 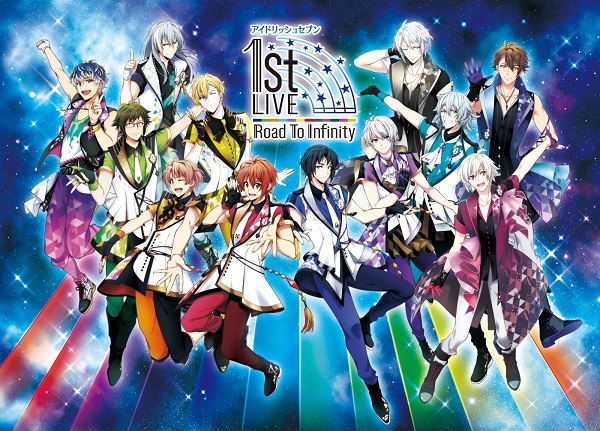 The game’s story takes place between the second and third story parts of the smartphone game, focusing on the IDOLiSH7, TRIGGER, and Re:vale groups on a combined tour across Japan. The game’s final destination is a concert at Zero Arena. An anime adaptation was first announced during a Niconico livestream event on August 2016. The 17-episode anime premiered on January and concluded on May 2018. Makoto Bessho is directing the anime at Troyca while Ayumi Sekine is supervising the anime’s scripts. Kazumi Fukagawa is adapting Arina Tanemura’s original designs for animation. Ei Aoki is credited as supervisor. Crunchyroll licensed the series for streaming as the anime simultaneously airs in Japan. The player assumes the role of Tsumugi Takanashi, an inexperienced manager for a new idol group under her father’s small agency. The idol group is named “IDOLiSH7,” and consists of seven male singers, each with their own unique personality and background. She must train and turn all of them into the famous idols, all the while struggling against the hardships of the entertainment industry. Before we go to the report live, let’s see a glimpse of character introduction. Each member has unique name in kanji and represent one music symbol. Members of IDOLiSH 7 contain numbers 1~7 in kanji. Their music symbols mainly consist of accidentals and dynamics. While mananging Idolish 7, there is rival idol group named “TRIGGER”, that belonged to the Yaotome Production Company. Their names contain numbers 8~10 in kanji and music symbols mainly consist of clefs. Last but not least, their one senior idol group “Re:Vale”, an idol group that introduced in the second chapter of the game. Their names contain numbers 100 and 1000 in kanji, music symbols mainly consist of repeat signs. Last idol group which appeared in third chapter is “ZOOL”, their names contain kanji of animals from the chinese zodiac, music symbols mainly consist of musical notes with the theme of repetition and silence. In continuous of commemorating 3rd anniversary and also 2.500.000 download all over the world, Ainana held their first live in Saitama this July. Chosen date also represent Ainana itself (7/7). Kojacon Team is very happy to attend Idolish 7 first live on July 7 – 8 at Seibu Prince Dome. Both days were really fun! Actually, last update from this title is mentioning 4 idol units. But on this first live, only 3 units performed. Let’s go then! Meet our seiyuu line-up for two days! This live also broadcasted in Korea, Taiwan, and of course all over Japan via several mentioned cinemas. So how about summarize two days live into one long report? Each supporting fans from IDOLiSH7, TRIGGER, and Re:Vale that already standby from early morning, were entering dome with colorful merchandise such as muffler towel and uchiwa. Some of them also cosplaying their fave member. Finally introduction screen is on, everybody stood up and get ready! As expected, first song was “MONSTER GENERATiON” and guess what? They were dancing just like the MV! 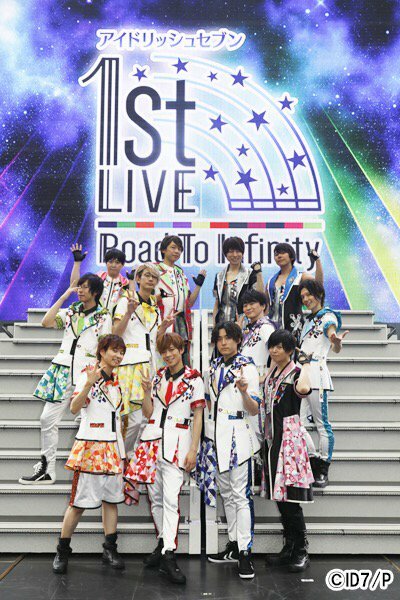 Looking at Iori, Yamato, Mitsuki, Tamaki, Sougo, Nagi, Riku, were wearing such similar costum with RTI’s visual just made audience scream more. After opening introduction and cast greeting, they continued with “Dancing∞BEAT! !”, “Joker Flag”, and Iori center song, “Perfection Gimmick” continuously. Onthe second day, second song was Tamaki center song, “The Funky Universe” and he was dancing on interlude part indeed. Audience waved their rainbow colored light stick in the air. Following was TRIGGER’s turn. Came with their debut song, Gaku, Tenn, Ryuu were singing “Diamond Fusion” which quickly changed lightstick’s color into their image colors. TRIGGER then greeted the audience and continued with “SECRET NIGHT” and “Last Dimension ~Hikigane Hiku no wa Dare da~”. On Sunday, TRIGGER’s second song was “Destiny”. Each song which performed flawlessly just made us dying. If you think Re:Vale will be the next turn, you’re wrong. MEZZO came on stage while singing “Ame” and “Koi no Kakera”. Those songs made fans calm down a bit by enjoying ballad song by Tamaki and Sougo when beautiful rain effects were flowing on screen. Following day, MEZZO brought up “Dear Butterfly” for their second song. Beautiful butterfly effects on screen made standing applause given from all audience. Next part was shuffle unit corner! Everyone left except Iori, Riku, and Tenn. We all know what should be the first song in this corner, right? Yes, correct! “Fure Fure! Seishun Sanka” started with three of them rode the small torokko and moved around arena area. Next song was “LOVE & GAME” where Tamaki, Sougo, and Ryuu popped out from the middle front of hanamichi with standing mics. Last song of course Yamato, Mitsuki, Nagi, and Gaku with “Danshitaru Mono! ~MATSURI~”. They took medium torokko and moved around standing area on 2nd floor! Louder scream here and there closed shuffle unit corner. When you guess TRIGGER will come up next, then we need to re-guess lol. Senpai idol group, Re:Vale came on stage while seating on big sofa, wearing different costum designed based on “NO DOUBT” song! They continued to perform on center middle of hanamichi until their next song, “Kiseki”. Lightstick’s color suddenly changed from rainbow into pink and pale green. Re:Vale sung “Taiyou no Esperanza” for their last song on following day. Our last turn, TRIGGER started their second turn with “DAYBREAK INTERLUDE”, continued by “HEAVENLY VISITORS”, and “Leopard Eyes”. They also change the costume which likely from the MV. Almost last part of the overwhelming live, IDOLiSH 7 re-enter the stage with costume based on their last MV for anime. But they was singing “MEMORiES MELODiES” instead. Continued with their last single “Nanatsuiro REALiZE” then took a ride on big torokko while move around between arena and standing area, they sung “PARTY TIME TOGETHER”. Riku said closing speech by sending us to Ainana Anime ost, “WiSH VOYAGE” which also the last song for both days. Our seven boys moved to the front stage together with rainbow theme airplane-shaped balloon above them. What a wonderful view! Let’s send them to the higher! Let’s take a break before encore. Not wait for another second, IDOLiSH 7 came on encore stage with “THANK YOU FOR YOUR EVERYTHING” for first song. Then they called TRIGGER to join them, as the expected “NATSU☆ Shiyou ze” IDOLiSH7 feat.TRIGGER version was echoing. They suddenly hold water-gun and started to shoot audience! Some of them took big torokko and move around the wayIn the middle part of this song, Re:Vale also joined with their bigger water-gun (or should we call it water bazooka? lol). Finally all of them were standing in the middle of mains stage. But don’t worry! This is not the end. It’s time for announcement! Riku and others asked us to see what will be displaying big screen with joy and excitement swirling around. Here’s the surprise! For closing, each members will give their goodbye speech one by one starting from Re:Vale, TRIGGER, and IDOLiSH 7. They said thanks to all audience who spent the weekend with them, also thanked all supporting fans from live viewing and overseas. 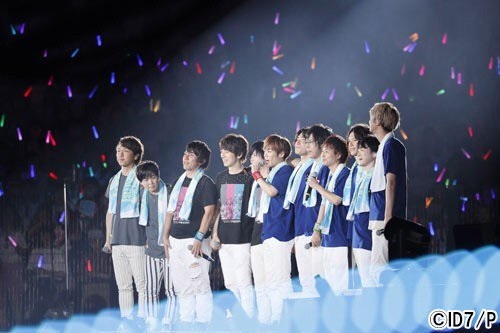 Last song was the full version of latest song which sung by all 12 members “Welcome, Future World!”. We always listen to the short version right? So that’s all 32 song (both days in total) performed at Ainana first live which brought about a lot of enthusiasm and inspirational moment. To all manager in this universe, thanks for joining us this time! Next concept from Ainana “Future Light” will be delivered soon for their 3rd Anniversary. Mobile game event Road to Infinity will be able to play right after this event. If you have time, please visit Ainana 3rd Anniversary cafe too. See you soon in next concert! Here’s enjoy last pict, RTI drawing by Arina-sensei, illustrator of Ainana.